Maybe I'm alone on this but, for me, Summer is all about re-reading old favourites. This year, I'm thinking about reading Paradise End by Elizabeth Laird and The Set-Up by Sophie McKenzie which are two of my favourite books from when I was about 10. I've read Paradise End 4 or 5 times over the years but I still love it just as much as I did the first time I picked it up. Another re-read is Amy & Roger's Epic Detour by Morgan Matson which I read for the first time two years ago. It was such a brilliant and absolutely hilarious book so I'm looking forward to reading it again. ^_^ Then, of course, there is Five on a Treasure Island by Enid Blyton. Need I say more? I'm reading two books at the moment: Quiet by Susan Cain and The Catcher in the Rye by J.D Salinger. I talked about Quiet in 'Currently I'm...#6' and since then I haven't actually made any progress because I decided to start The Catcher in the Rye, so my opinion is the same as in that post. The Catcher in the Rye seems to be a quite a controversial book with some people loving it and some people really hating it...so far, I'm actually enjoying it so I have a feeling I'll be one of the people who loves it by the end. We'll see. :D As for White Teeth by Zadie Smith, it's been on my TBR for quite some time so I'm hoping to finally read it over the Summer. 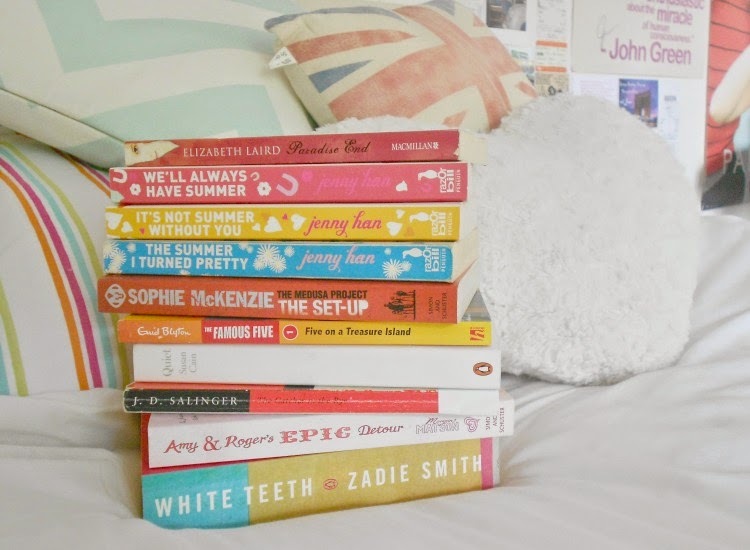 What's on your Summer TBR pile? Do you have any all-time favourite Summer books? Really interesting to see what you plan on reading! I'm like you in the sense that I get LOADS of reading done over the summer, but unlike you I don't plan on re-reading anything. The plan is to read as many books off my TBR pile as possible. Actually having said all this, I've just decided to re-read at least 1 Harry Potter book again. Looks like a nice mix of books ... Enid Blighton!! I accidentally started re-reading Malory Towers quite recently ... sorry-not-sorry!! A bit of summer YA is always nice ... I am about to start Fangirl by Rainbow Rowell and frankly I couldn't be more excited. I need to read Gatsby and Macbeth for Higher English ... apart from that, books I'm particularly excited for are Rose Under Fire by Elizabeth Wein (because I LOVE Code Name Verity), Persuasion by Jane Austen and, FINALLY, A Game of Thrones! I've been waiting to read it for so long, the excitement is mounting seriously now!